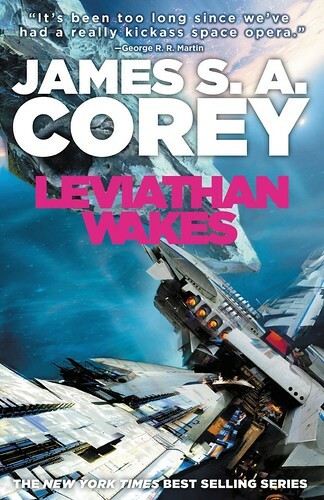 This is a review of James S. A. Corey’s science fiction novel ‘Leviathan Wakes‘. It’s the first in a series, although this book contains what seemed like a mostly stand alone and complete story. As the cover mentions, this is good old fashioned space opera. It has lots of action including planets at war, intense space battles, desperate circumstances, an alien threat, zombies (yes zombies), evil corrupt corporations, and very human characters. The action mostly takes place in the asteroid belt. Humanity has settled throughout the solar system. Earth and Mars are the main superpowers. The asteroid belt settlers are not a separate state, but there are separatist movements among them. At the beginning of the book, long simmering tensions are high. There are two protagonists in this story. One is Jim Holden, a somewhat idealistic first officer on an ice mining ship operating in the belt, who finds himself suddenly leading a small crew in a series of desperate situations. The other is Miller, a hardboiled somewhat burnt out police detective at the Ceres asteroid station, who receives an assignment to track down the rich daughter of a rich and powerful family. Holden and Miller’s situations turn out to be at the center of a conflict that, as the story progresses, causes the solar system to descend into war. As it progresses, it becomes increasingly evident that there is much more than meets the eye going on, with an existential threat to humanity gradually coming into focus. Holden and Miller are eventually thrown together and, despite very different outlooks, end up having to work together to survive. The interplay between them, and their differing philosophies, end up serving as the launching ground for philosophical discussions about when information should be widely distributed. Should the people be told everything, even if it might lead to panic, or should some things be kept from them, for their own good? This makes for an interesting tension interwoven into the storyline. There was a lot to like in this book. As I mentioned above, the characters are well developed, and you can feel their fear and desperation in many scenes. The authors do an excellent job of providing details that allow you to sharply visualize the world and settings that the characters exist and move around in. I said authors (plural) above because James S. A. Corey is actually the pen name of a pair of writers: fantasy author Daniel Abraham and Ty Franck, George R. R. Martin’s assistant. (Yes, the George R. R. Martin of Game of Thrones fame.) Martin’s influence in character development seems to show in this book. All of the characters feel rich with understandable motives for what they do. In an interview at the back of the book, Corey (presumably one of the authors) explicitly claims that this is space opera in the old tradition, and that it isn’t hard science fiction. However, I didn’t see any obvious violations of scientific laws, although many might quibble with the Epstein drive, presented as a sort of fusion drive, that enables the characters to move at will around the solar system, probably with more efficiency and capacity than an actual fusion drive might deliver. A deeper criticism might be that the authors ignore some concepts such as artificial intelligence. Computers as presented, although perhaps more powerful than present day ones, don’t seem to have any additional types of capabilities than what we have today. I recall a very brief reference to quantum computing, but not one that factored into the plot. Contemplation of transhumanism comes up in one of the character’s thoughts, but only in a cautionary and pejorative manner. And the events of the novel heavily imply that it’s not a good idea to pursue it. It will be interesting to see if any of these themes are revisited later in the series. Of course, every author is entitled to their vision of the future, and these aspects of theirs helped contribute to a gripping and totally enjoyable story. If you’re looking for space opera in the Lensmen tradition (although far better written), with engaging characters, lots of action and adventure, then I highly recommend this book. I’m looking forward to the rest of the series. This entry was posted in Zeitgeist and tagged Daniel Abraham, james corey, Leviathan Wakes, Science fiction. Bookmark the permalink. I found out later today that it’s slated to be a TV series. I just read that. Always better to read the book first, though. By chance, have you heard anything about the new Dune film that was (apparently) being made? I sure haven’t. The first David Lynch movie adaptation was a bit bizarre, but I thought the TV miniseries was pretty well done. Didn’t know they were looking at another one. Yeah, something was happening but then everything went quiet.